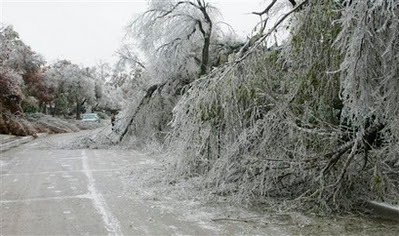 Here are some pics of the terrible storm that hit Oklahoma on December 9th, 2007. We were without electricity but we have a gas fireplace and a gas oven so we were warm and also able to cook. Day 1 is up to the table and then day 2 is the table with longer ice on it! We went to Collinsville today the 12th and it just looked like a war or a bomb had gone off. It was terrible!